"My professors are very supportive and provide many opportunities for both personal and professional growth. I've always been able to approach them and ask for advice. I've also truly appreciate the fact that the vast majority of my classes have been meaningful and applicable to the real world." During the 2015 winter term, I was among sixteen Miami students who spent four days touring a variety of companies in the news, journalism, and communications industries for the NYC Media trip, led by Professor Patricia Newberry. Our packed schedule involved interviewing journalists throughout each day and attending fun-filled cultural events at night. The experience opened me up to the world of journalism in a totally new way. The overarching theme was the journalistic move toward digital. New devices, innovative methods of news consumption, and the social media boom have completely changed the ways that news organizations are disseminating their information and the ways that people are consuming it. For our first day, we visited CNN to speak to host of Reliable Sources Brian Stelter about the importance of generating organic content and then national correspondent Susan Candiotti about her coverage of heavy news stories that involve crime and terror. We then dropped in at The Daily Beast to meet Abby Haglage, a reporter and Miami alum, about drug reporting. Our next stop was CBS Sports to meet Stuart Millstein, the head of sports research. Miami alum Cassie Carothers, a deputy editor of breaking news at Yahoo News, then shared helpful insight about how to be smart about doing whatever it takes to get the job that you want. Our second day began at Fox News, where we met Miami alum and host of America's Newsroom Bill Hemmer, who talked about the fast-paced nature of the news and how his team keeps up with breaking stories. We then headed to The New York Times to meet political columnist Gail Collins about the radically changing nature of writing in the digital age. We also interviewed the late media columnist David Carr, who gave us his fascinating interpretation of social media, and ombudsman Margaret Sullivan, who discussed how the Times is adapting to digital media. Day three started with meeting Miami grads David Marino-Nachison and Lisa Bannon, special projects editor and deputy of arts and culture, respectively at The Wall Street Journal. We next visited Bloomberg News to interview investigative reporter Andy Martin, tech reporter Sam Grobart, and stock market reporter Leslie Picker. We next visited the startup magazine Capital New York to speak with Miami alum Emily Hohlman along with co-founders Josh Benson and Tom McGeveran and VP of Operations Katherine Lehr. Our final interview of the day was with Barton Gellman, a contract freelancer for The Washington Post, who played a pivotal role in the Edward Snowden case. Our final day in New York began with meeting Melissa Knific, a Miami alum and associate food editor for Family Circle, and then on to Fitness magazine, where I had the privilege of interviewing digital director Amanda Wolfe, who examines web trends to develop stories. "Digital has enhanced the magazine experience by broadening stories," she told me. "It's a way of saying, hey, if you like the digital content, you’ll like our print content, too!" Our final interview was at Hearst Corporation, where we spoke to Alie Martell, managing editor for cosmo.com, and Jane Frye, a Miami alum and managing editor for Hearst Digital Media. In the evenings, we were also fortunate to see live tapings of The Daily Show with Jon Stewart and The Late Show with David Letterman. We also went to Guy Fieri's restaurant and saw a Broadway show called "It's Only a Play," starring Matthew Broderick, Martin Short, and Stockard Channing. Looking back at my four years at Miami, I feel that the combination of my outstanding classes and supportive professors, one-of-a-kind J-Term trips, and lifelong friendships have all made my college experience the best I could have ever asked for. Although it's been difficult to say goodbye to a place I've come to love so much, New York City is waiting for me to start a new chapter as an international coordinator for American Eagle Outfitters. I will always deeply cherish my learning and memories from Miami and take them with me throughout all of my future endeavors! "Both of my maternal grandparents graduated from Miami in 1957. They showed me around Oxford when I was a sophomore in high school, and I fell in love with it right away. 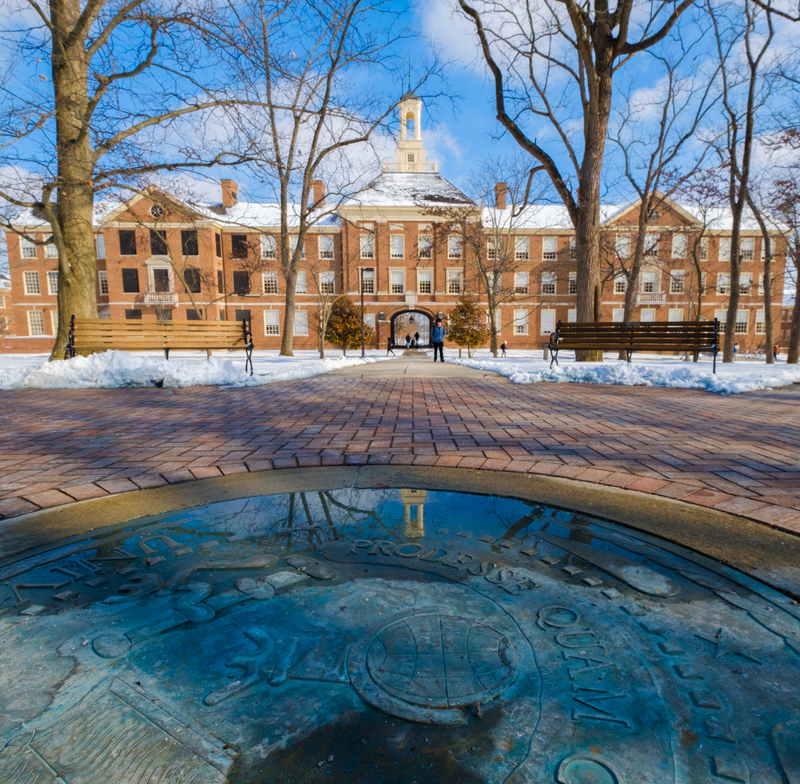 Even though my parents wanted me to consider other schools, I knew that there was no point because of my attraction to Miami's beautiful campus and awesome academic programs. I visited a handful of other schools, but my heart was always with Miami and I applied early decision. Although New Jersey is about an 11-hour drive and a 90-minute plane ride away, I was looking for a change of pace. "As a first-year student, I declared my major in Strategic Communication immediately. I'd been interested in the field since high school and knew I'd made the right choice. The first few classes were interesting, and many Miami Plan classes transitioned nicely into the major. I complemented it with Marketing and Management & Leadership minors to give myself a more integrated course load and open more doors. With my wide variety of classes, I hope to end up with a marketing, advertising, or public relations-oriented career. "My major and 2 minors are different yet complementary, which has given me a well-rounded learning experience. Besides my classes and professors, Miami offers a great number of valuable extracurricular opportunities. As an executive board member of Miami's Public Relations Student Society of America chapter (PRSSA) and a communications intern here at the CAS, I've been able to gain wonderful leadership experiences, meet tons of great people, and really boost my resume." Sarah Rogers (3rd from right) and friends pose in Italy. "I'm thankful for the amazing friends that I've made over the years, including my best friends from first semester of freshman year that have always stuck with me and my sorority sisters in Alpha Phi. 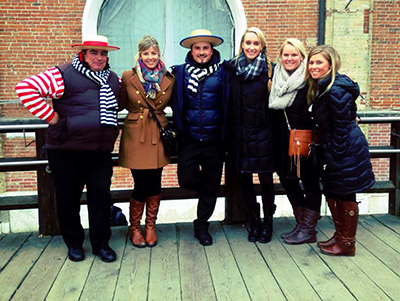 "Studying abroad was a definite Miami highlight. I traveled to Florence, Italy during the 2014 January Term through the American Institute for Foreign Study (AIFS). I went with a few Miami friends to take an Italian fashion class. We explored Italian fashion designers all throughout history and studied the prevalence of Italian fashion nowadays. We toured Salvatore Ferragamo's flagship store, the Gucci museum, the Florence leather school (Scuola del Cuoio), a variety of local artisan workshops, and much more. We were really immersed in the culture and lived right in the middle of the city. The trip was amazing and we packed a lot in over 3 weeks! "This January, during my second winter term, I participated in the NYC Media program led by Professor Patti Newberry. A group of about 20 of us visited a various news outlets in New York City and were immersed in the journalism and media industries. Highlights included trips to the New York Times, the Wall Street Journal, CNN, Fox, and the magazines Fitness and Family Circle. We were also fortunate enough to sit in the audience for the Daily Show with Jon Stewart and the Late Show with David Letterman, during Letterman's final season. We had a fabulous week in the Big Apple! "My professors are very supportive and provide many opportunities for both personal and professional growth. I've always been able to approach them and ask for advice. I've also truly appreciate the fact that the vast majority of my classes have been meaningful and applicable to the real world. One of the best classes I've taken was one of Patti Newberry's journalism classes [JRN 201-Reporting and News Writing I]. She is an extremely caring and attentive professor and has become a mentor for me. Shara Clark, my capstone [COM 459-Advanced Public Relations] professor and Miami's PRSSA advisor, has also taught me a lot and helped me prepare for the start of my career. "I'm also thankful for my involvement in Miami's PRSSA chapter, which has over 250 members and is the largest in the country. I joined the publications committee and started writing articles for the newsletter, entitled "PRemiere," during my sophomore year. After becoming the VP of Publications at the end of last year, I revamped the entire newsletter and now run a committee of 18 writers. We hold meetings to develop articles and peer-edit them. I then format and produce the newsletter through Adobe InDesign and disseminate it through Miami's communication-related listservs, including that of PRSSA and the Department of Media, Journalism and Film. "My Strategic Communication major is all about developing relationships, branding, and planning elements of a campaign from start to finish. My two business minors complement this and it's nice to have 3 different courses of study at once. In my career I want to think creatively, plan strategically, and brand effectively. It would be an added bonus to be able to integrate one of my personal passions (i.e. fashion, beauty, entertainment) as well!" 'Strategic communication is very creative and involves a lot of writing, which has always been my strongest academic skill. In COM 259 [Introduction to Strategic Communication and Public Relations], I learned the basics of developing a public relations campaign and created one for an assigned client. As part of a group, I chose my own client in a more intermediate version of this in COM 359 [Strategic Communication Planning]. These two experiences led to a more advanced assignment in COM 459, which pulled together everything we had learned about creating a PR campaign. We identified our client's main problem, conducted various forms of research, analyzed key findings, determined the clients' publics/audiences, set goals and objectives, developed strategies and key messages, executed print and online tactics, planned a timeline, came up with a budget, and identified how to evaluate the effectiveness of the campaign. I'm able to walk away from these core strategic communication classes with invaluable knowledge about these key campaign elements and how to creatively solve client problems. "Whether you're devising an advertising or a public relations campaign, I learned that you have to become an expert on your audiences, creatively reach them, think strategically, and so much more. The whole process is very interesting and dynamic; I've learned something different every day. "Beyond my major and minors, I've enjoyed a number of liberal arts classes. Last year, I took an international studies course [ITS 201-Introduction to International Studies], which was about disciplines such as anthropology and economics and how they apply to past, present, and future world issues. I also took a family studies course [FSW 365-Family Life Sexuality Education Across Cultures], which focused on sexuality issues and education processes. This semester, I'm taking an American Studies elective [AMS 207-America - A Global Perspective] to learn more about America's role in globalization." Last summer, I held an internship in New York City at Universal McCann, which is a prominent media agency owned by Interpublic Group (IPG). L'Oreal and Sony are a couple of its largest accounts. I worked on the new business team and was involved in the pitch process for client prospects including Office Depot and the New York Lottery. I helped the team by developing pitch video content, participating in focus groups, handling pitch meeting logistics, conducting extensive background research about prospective clients, developing and proofreading pitch materials and running trend reports via Kantar to analyze media spend, competitive spend, and media mix patterns among both competitors and potential clients. "The biggest pitch I was involved in was the effort to win the multimillion-dollar media account of the New York Lottery. I helped to create a video that ultimately played for the client on the morning of the pitch. One morning I nonchalantly walked into work and my supervisor told me, "It's a good thing you're wearing a colorful dress today, because you're going to go convince people to talk to you on camera!" I had no clue what my team was talking about, but there was a film crew waiting outside for me, along with an SUV and a driver. My job was to persuade people who sell New York Lottery tickets behind the counters of bodegas and convenience stores to talk to me on camera! "Our goal for the video for the client was to explore the perspectives of the people actually selling lottery products, showing that our company really thinks outside of the box. I had to be aggressive with people to get them to talk to me, and because the camera crews were intimidating to most of the sellers, I had to think fast and strategize. Sometimes I would go into the stores alone, and sometimes I had to make up excuses such as I was doing this for a school project. But, with those that I did convince, I led detailed interviews about some of the best lottery wins that the sellers witnessed, what it's like to sell lottery products, and so on. I ended up with eight strong clips, helped the editors select the best ones, and saw the final creation come to life on the morning of the pitch, as the representatives of the New York Lottery walked into the office. It was amazing to know that I had really done something to make a direct impact on the pitch process, and my internship was a truly invaluable experience. 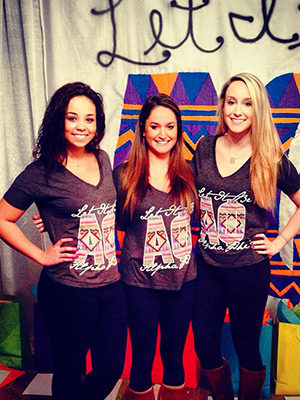 Sarah Rogers (right) poses with a couple of her Alpha Phi sorority sisters. "During the summer of 2013, I held an internship at Platinum Rye Entertainment, another New York City agency that does celebrity branding for advertising and public relations campaigns. One of my tasks was maintaining the company's entertainment blog to keep both employees and clients on track with updates about anything and everything related to the entertainment industry. If a new movie came out, a new album was released, or a new actor or actress was on the rise, I'd write a detailed blog post explaining the prevalence of the news and, more specifically, explain how a certain celebrity might potentially be useful in a campaign. Other tasks included creating customized presentation decks to match celebrity candidates to campaigns based on client requests, creating a comprehensive music licensing database, and conducting extensive research about endorsements and press attention of prospective celebrity endorsers. The internship was fun and interesting!" "Seize every opportunity that you can grab. Doing so has really helped me grow and narrow down what I want to do. Networking is also crucial. Always be prepared to meet new people and go after what you want! Always know your little 'elevator speech' and be confident about your interests and goals. It is also crucial to try as many new things as you can within the realm of what you're studying. Get involved in on-campus organizations related to your major or minor and try your best to obtain a leadership position. I've always had a ton going on between academics, extracurriculars, and social life, but I enjoy having a lot on my plate. Every experience is a learning one. "I'd also like to add that although the Farmer School of Business is very prevalent on campus, CAS students who are interested in marketing or communications shouldn't be discouraged by not having a major and degree in that school. I pondered the idea of having a Marketing major at one point, but I truly feel that my experiences have been more valuable as a CAS major. 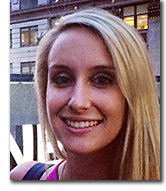 By adding 2 business minors to my major, I've had an ideal learning experience."